The Police were a band that stood out from the punk and new wave music scene of the late 70s/early 80s. They achieved incredible success by defying expectations and creating a sound all of their own, one that would inspire generations of musicians and artists to follow. The band's story, too, is a fascinating one: three very unlikely musicians drawn together in a tumultuous combination which produced incredible music yet could not be sustained for more than five studio albums. This page is here to provide some introductory information and links on The Police, as well as classic videos, links to purchase Police music and merchandise, and also interesting information on the band members' more recent musical projects and undertakings. All photographs on this page are by the author, sockii, unless provided by Amazon or eBay. Andy Summers and Stewart Copeland of The Police, on stage August 7, 2008. Stewart Copeland came up with the idea for The Police in 1976. At the time, the American-born drummer was a member of the progressive rock band Curved Air, and he could see how the musical scene was quickly changing. "Prog rock" was dying under the weight of its own excesses and grandeur; punk music was exploding in its wake, celebrating raw energy and a do-it-yourself ethos. Copeland wanted to capitalize on this trend so he decided to form a "punk" band, even if his credentials (and that of bassist/singer Gordon Sumner, otherwise known as Sting) were decidedly un-punk. Sumner was a school teacher who had been playing music with the jazz-fusion band Last Exit when Copeland first saw him performing, and invited him to London to join his new punk band. Their first guitarist, Corsican Henry Padovani, was the only true "punk" among them and it was hard going for the band to get any traction on the British music scene at first. Through a series of events they hooked up with experienced session guitarist Andy Summers, who clicked much better with Sting musically and inspired Sting to start writing more complex songs. After a brief period as a four-piece band, Henry was eventually asked to leave and The Police became the trio we know today. Popularity still eluded the band for some time, even after the release of their first album Outlandos d'Amour in 1978. However, America started to embrace the band after they embarked on a low-budget tour of small clubs around the country. By 1979, "Roxanne" was getting radio airplay in the UK as well as the US, setting the stage for further success with their second album, Reggatta de Blanc. 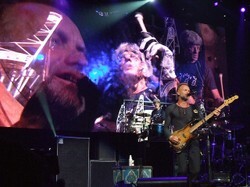 The Police at a soundcheck in Philadelphia, July 29 2008. The band continued to aggressively promote and market themselves and in 1980 embarked on their first world tour, performing in such diverse locales as Mexico City, Mumbai, Hong Kong, Osaka and Cairo. Their hard work paid off and by the release of their third album, 1980's Zenyatta Mondatta, the band were poised for international superstardom. Sting's individual stardom, too, was rising after his appearance in the film adaption of The Who's Quadrophenia and other acting roles. However, creative conflict within the band was rising as well. In 1981, The Police recorded and released their fourth album, Ghost in the Machine, after which the band members took a brief sabbatical to pursue solo interests. When they reconvened for 1983's Synchronicity, the resulting album was their most commercially successful to date, launching a series of hit singles and bringing them to the heights of world stardom. On their supporting tour for the album, they would even play to 67,000 people at the legendary Shea Stadium in New York. Although The Police never officially "broke up", after Synchronicity the band members went on to pursue solo careers, reuniting only briefly for the 1986 Conspiracy of Hope Tour and when inducted into the Rock and Roll Hall of Fame in 2003. Fans' hopes and dreams of a real band reunion would not be realized until 2007, when The Police embarked on a 16-month tour performing over 150 dates around the world. Between the years 1978 and 1983, The Police released 5 studio albums. Though not a large body of work compared to some bands, these songs were vital and original enough to leave a lasting legacy on the rock music world that continues through today. The Police's debut album presents the band at their rawest and most vital. Here the punk-meets-reggae sound is at its purest in classic songs such as "Roxanne", "Can't Stand Losing You" and "So Lonely", yet their are also songs like the jazzy "Hole in my Life" that showcase the band's wider musical leanings and roots. 1979's Reggatta de Blanc is considered a true classic, often named as a favorite by Police fans around the world. Beyond the hit songs "Walking on the Moon" and "Message in a Bottle", the album features several great "deep cuts" like "Deathwish" and "Does Everyone Stare". Copeland fans tend to especially favor this album as it features the most songs written or co-written by the drummer - the comparison in sound to his own "Klark Kent" releases of the time is quite noticeable. The band's third album, Zenyatta Mondatta, was written and recorded under a fair amount of stress and time pressure in between tour dates - and some would say the pressure shows in the results. And yet the album still yielded two monster hits: "Don't Stand So Close To Me" and "De Do Do Do, De Da Da Da". Here too, Sting's songwriting starts to go beyond love ditties and typical pop subject matter with strong songs like "Driven To Tears", a blinding showcase for all of the band members' musical talents. Ghost in the Machine marked a strong shift in the band's sound upon its 1981 release. Recorded at Air Studios in Montserrat, the songs prominently feature synthesizers, brass and piano accompanying the drums, guitar and bass. Hits from this album include "Spirits in the Material World" and the now classic "Every Little Thing She Does Is Magic", however it's the album cuts including Copeland's "Darkness" and Sting's "Secret Journey" which elevate the album to a favorite among many fans. From Outlandos to Synchronicity...which do you enjoy the most? I don't have a favorite/I can't choose! If you're interested in learning more about The Police, then your best bet is to check out these books written by the band members (and close associates) themselves. Sting was the first member of The Police to write his memoirs, in 2003's "Broken Music". This book primarily covers Sting's early years: his childhood, his early musical adventures while working as a schoolteacher, and then finally making the move to London to join The Police with Stewart Copeland and Henry Padovani. "Broken Music" only covers The Police years through their first performance at New York's CBGBs, but it still reveals a great deal about Sting and the events that shaped his life, music and career. Stewart Copeland's 2010 book is a fun and breezy collection of tales and adventures, more so than a typical autobiography. He writes primarily about his years before and after The Police, preferring to let his film "Everyone Stares: The Police Inside Out" speak for itself on that time period. However, his book is the only to cover the Police Reunion and what it was like to attempt to go back to the band after so many years apart. Original Police guitarist Henry Padovani released an English-language version of his memoirs in 2010. It's an interesting look at his involvement in the punk and new wave music scene during his Police time and well beyond that, touring with Wayne (later Jayne) County & The Electric Chairs, forming his own band, and then becoming involved with IRS records European division and music management. Capturing the band at the height of their success, this Godley & Creme-directed concert video from 1984 is finally available on DVD and a delight to experience once again. Although some of the video effects are cheesy and overdone, there's no denying the raw energy of the band in this performance that includes all of their big hits - and is a fabulous blast back to the past in all of its 80s glory. In old photos and videos of The Police, Stewart Copeland was almost always seen with his video camera in hand. In 2006, he finally turned that old home video footage into this documentary, an absolute delight and must-see for all Police fans. Featuring his humorous narration and a score consisting of Police songs "deranged" by Copeland, it's a wonderful look at what it was like to be in The Police: from the "inside out". Although long out of print and only ever available on VHS, "Around The World" is a classic Police video documentary that every fan should attempt to track down. Follow the band as they tour Japan, Hong Kong, South America, Greece, Egypt and Australia and enjoy lots of great concert footage - and bizarre clips like Andy taking on a Sumo wrestler! Relive the music and excitement of the band's 2007-2008 Reunion Tour with this live performance, recorded in Buenos Aires. Bonus material includes the documentary "Better Than Therapy", looking at what it was like for the band to rehearse, perform and tour together for the first time in so many years. Sting during a Police soundcheck, Denver, July 2008. All three members of The Police have had busy careers in the years following the band's last studio album. Sting, of course, has continued on to major commercial success as a solo recording artist. He has received numerous awards for his songs and albums, from 1985's The Dream of the Blue Turtles through 2010's Symphonicities. He continues to tour and perform in front of sold-out audiences around the world, and is involved in numerous activist causes. Recently, Sting has been working on his first musical, "The Last Ship", about shipyard workers in his home town of Newcastle. Stewart Copeland went on to an in-demand career as a soundtrack composer for film and television, including the series The Equalizer and Dead Like Me. He has recorded and toured with several other bands including Animal Logic, Gizmo and Oysterhead. His more esoteric projects have included music for ballet, symphony and orchestra, including the recent Gamerlan D'Drum. Today he is also highly involved in social media and has his own YouTube channel for sharing spontaneous jam sessions with other musicians ranging from Snoop Lion to Jeff Lynne. Andy Summers has recorded more than a dozen solo albums, primarily in the jazz-fusion and new age music styles, and continues to tour and perform live music today. He is also an avid and highly regarded photographer whose work has been featured in many exhibits and several photographic book collections. Most recently his autobiography "One Train Later" was used as a basis for the documentary "Can't Stand Losing You: Surviving The Police". He also formed a new band in 2013 with singer/songwriter Rob Giles, Circa Zero, which released their first album in 2014, Circus Hero. Official site for the band with news, discographies, and official merchandise. Official website with news, message board (for fan club members only), merchandise and more. Stewart Copeland's website with news, multimedia, a message board and tour archives. Get the latest news on Andy's upcoming projects on his official website. The PoliceWiki is a fan-run site dedicated to providing the most detailed information about the band on the internet! Detailed daily itineraries, memorabilia, discographies, photos and more are collected here - and contributions are always welcome! Official Site for Rare Records and Memorabilia. Fan-run news site for information on Sting, Andy and Stewart. Includes a messageboard forum for fans. Sting, Stewart Copeland and Andy Summers: They were The Police, one of the biggest bands of the late 70s and early 80s. Learn more about them in this article: their music and their legacy. Do you love the music of The Police? If so, take my "Ultimate" fan survey all about the music of Sting, Stewart Copeland, and Andy Summers. Each member of the Police: Sting, Stewart Copeland, Andy Summers and yes, Henry Padovani - have now released their autobiographies. Here you will find some basic information on each. In 2007 rock band The Police announced they would be reuniting for their first tour since the 80s. As a lifelong fan of the band, I couldn't miss the opportunity to see them as many times as possible! All about the documentary film following musician Andy Summers' life in an outside of The Police. Andy Summers is one of the most influential guitarists of the 1970s, 1980s and beyond! Learn more about this incredible musician beyond his work with The Police. Musician Stewart Copeland is mostly known as the drummer for the rock band The Police. However, Stewart has also composed the soundtracks to many films and tv series through the years. eBay is the best place to find vintage Police items! It should come as no surprise that some of the offspring of The Police have inherited their parents' musical talents and pursued a career in the music industry. Stewart Copeland's son Jordan, pictured left (whose mother Sonja Kristina is a celebrated musician in her own right) is singer and guitarist with the band Hot Head Show. The band has seen success touring in support of Les Claypool and Primus in Europe and the United States. Two of Sting's children have also pursued careers in music. Joe Sumner has recorded and toured with his band Fiction Plane (first known as Santa's Boyfriend) for over a decade, and they were even the opening band for much of The Police's Reunion Tour during 2007 and 2008. Sting's daughter Coco Sumner has recorded and released music under the name I Blame Coco, showcasing her strong vocal talents with music that varies from reggae-fusion to synth-pop. The music of The Police has left a lasting legacy on rock music that continues through today. Indeed, you can turn on the radio currently and hear that influence directly in popular songs like Bruno Mars' "Locked Out of Heaven" and Gotye's hit sensation of 2012, "Somebody That I Used To Know". From the Sting-like vocal harmonies to the trademark sounds of Copeland's drumming and Summers' guitar-work, you can hear the influence in many other artists' work. And even when not directly noticeable in their styles, many of today's top musicians such as Foo Fighters drummer Taylor Hawkins name The Police as a major inspiration and influence. Just check out some of the clips below and see if you can pick out the "Policiness" in the music - and also enjoy some artists paying direct tribute to the band in cover performances of popular Police tracks.